If I had to pick my husband’s favorite cookie that he can’t keep his hands off, it would be shortbread cookies. 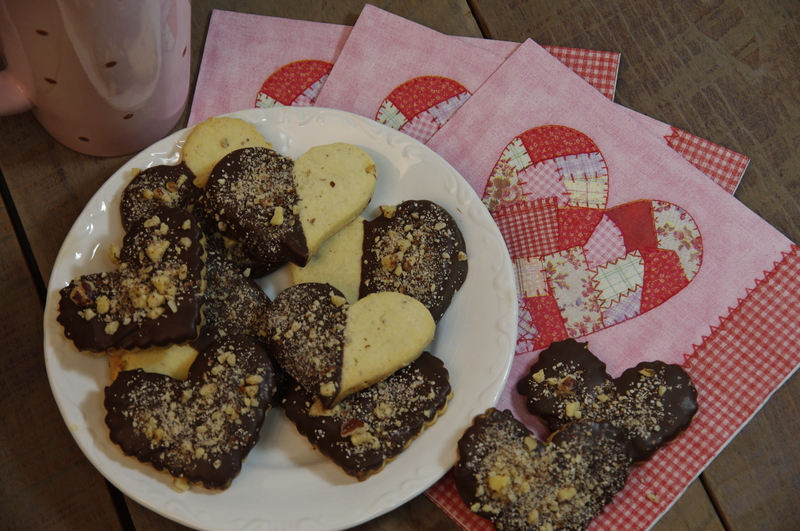 So for Valentine’s Day this week I baked him a batch of heart shaped shortbread cookies with an added Fresh From Oregon taste, hazelnuts. If you have been following my blog you know I LOVE hazelnuts. I never baked with them until I moved to Oregon 7 years ago and discovered this gem of a nut. I substitute hazelnuts in the place of other nuts in most of the recipes I make now. If you are not lucky enough to have fresh hazelnuts near you pecans make a good substitute in this recipe. This can be made and eaten plain, that’s how my husband prefers them, but I like them dipped in chocolate and sprinkled with more hazelnuts. 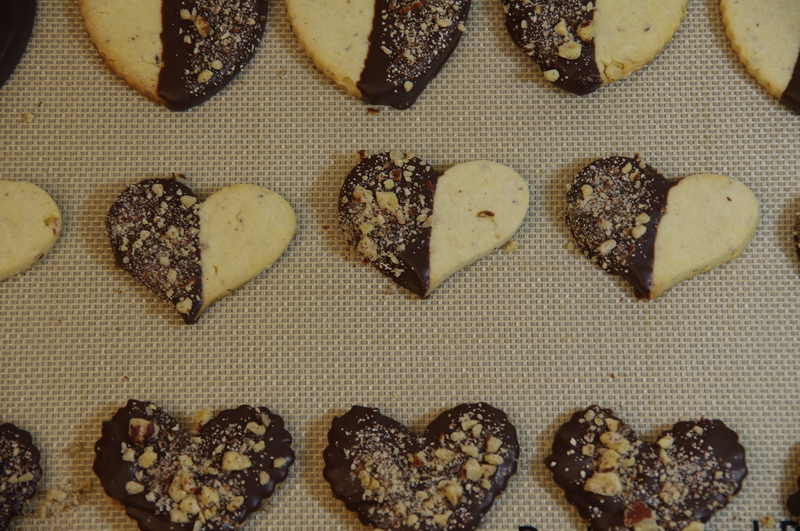 Enjoy and make these for your sweetheart this week. Cream butter, sugar and vanilla in the bowl of a stand mixer. Add egg yolks and mix for 30 seconds. Add flour and hazelnuts and mix until just combined, do not over mix. Form into a ball and flatten slightly, wrap in plastic wrap and refrigerate for about 2 hours. Preheat oven to 350 degrees. On lightly floured surface roll shortbread dough to 1/4-inch thick. Cut out shapes using your favorite heart shaped cookie cutters. Place on lined baking sheets and bake for 10-12 minutes or until lightly brown around the edges. Cool on a wire rack. Melt chocolate in a small bowl in the microwave for 30 seconds, stir and place back in microwave another 30 seconds. Repeat one or two more times until the chocolate is melted. Dip half the cookie in the melted chocolate and sprinkle with the hazelnuts. Place on lined baking sheet to set. The hazelnut became Oregon’s official State Nut in 1989. About 650 Oregon farm families grow hazelnuts on 28,400 acres. Hazelnut trees can produce until over 80 years of age. The hazelnut is unique in that it blooms and pollinates in the middle of winter. Wind carries the pollen from yellow catkins to a tiny red flower, where it stays dormant until June, when the nut begins to form. n 1858, the first cultured hazelnut tree was planted in Oregon by retired Hudson’s Bay Company employee, Sam Strictland in Scottsburg.